A riff on the familiar lullaby depicts various animal parents, and then a human father, soothing their sleepy little ones. An opening spread includes the traditional first verse of the titular lullaby, but instead of depicting a human baby in a treetop cradle, the accompanying illustration shows a large tree as habitat to the animals that are highlighted on subsequent pages. 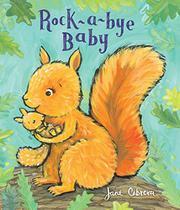 First the perspective zooms in on a painterly illustration rendered in acrylics of a mother squirrel cuddling her baby with text reading “Rock-a-bye Squirrel, / high in the tree, / in Mommy’s arms, / cozy as can be.” In this spread and others the cadence doesn’t quite fit with the familiar tune, and repeated verses featuring different animals—all opening with the “Rock-a-bye” line—don’t give way to the resolution. No winds blow, no boughs break, and the repetitive forced rhythm of the verse could cause stumbles when attempting a read-aloud. The final image of a human father and baby, whose skin tone and hair texture suggest that they are perhaps of South Asian descent, provides pleasing visual resolution in a book with art that outshines text.